Liven Up Your Event with a Glamorous Belly Dancer! 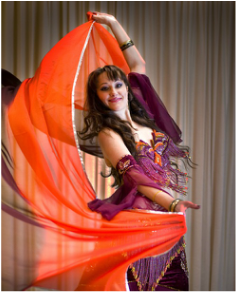 Based in Melbourne, Australia, Kaylah offers Belly Dance performances for birthday parties, anniversary celebrations, engagements, Hen's night parties, family parties, weddings, corporate functions, festivals, restaurants or other special occasions. Kaylah is a delightful and fun loving performer who has a talent for engaging the audience and ensuring each performance is a memorable one! See the Belly Dance Performance page for more information on the types of shows. A wide variety of music is available including Egyptian, Lebanese, Moroccan, Indian, Turkish, Greek, Arabic Pop, Traditional and Contemporary. Contact us to enquire about hiring a belly dancer in Melbourne or a group of bellydancers to add the finishing touch to your next event. Party Ideas? We can help. Kaylah and her team are experienced performers & entertainers. You can be satisfied you will receive a professional, high quality show. Feedback & list of some previous performances here. As well as shows for family parties and special functions, we are also involved in community events and activities around Melbourne. See our Latest News for details on past events or where to see one of our shows. Read our expert guide on "How to Host a Fabulous Hens Party". Read about our trip to the World Belly Convention in Korea and Kaylah's trip to the Red Sea, Egypt. Kaylah is on a break from teaching teaches weekly belly dance classes and belly dancing lessons, however is available for private lessons. Contact us now to enquire about hiring a belly dancer so you don’t miss out! Bookings filling up quickly, contact us today. in Melbourne and surrounding areas.